You can delete files, folders, or links in your SharePoint document library that you don't need anymore, such as old content or obsolete folders. Note: Links are only available in SharePoint Online. Note: These steps are for unmodified versions of SharePoint. If your administrator or company has customized your app, you may not see these options. Important: When you delete a folder, it deletes the folder and any files or subfolders it contains. Consider moving or archiving the contents of the folder before deleting it. You or your administrator might be able to recover a folder and its contents from the Recycle Bin. In SharePoint, open the document library and hover over the item you want to delete, and click the check mark. Note: Does your screen look different than this and you're using SharePoint Online or SharePoint Server 2019 ? Your administrator may have SharePoint Classic experience set on the document library. If so, see Deleting items in a SharePoint Classic experience library. To delete multiple items, repeat this step. You can delete as many items as you want. Click Delete on the Top Link bar. In the Delete dialog box, click Delete to remove the item. You'll see the status box appear in the upper top of the document library telling you that the item has been deleted. In classic experience there is no Top Link bar. Here's how to delete items. 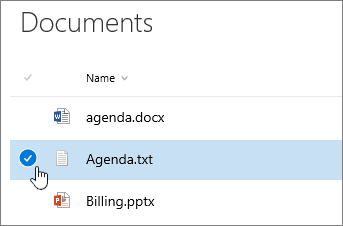 Open the SharePoint document library where you want to delete items. Select one or more items that you want to delete by hovering over the folder and then clicking the check box. Right-click a file, folder, or link icon and then click Delete. Navigate to theSharePoint site containing the library for which you want to delete the item. Click the name of the library on the Quick Launch bar, or click Settings , and then click Site contents, and then look for and click the name of the library. Note: Designers can modify the appearance or navigation of a site significantly. If you cannot locate an option, such as a command, button, or link, contact your administrator. Click the ellipses (...) on the row you want to delete, and click Delete or Delete Item. If you don't see Delete, or Delete Item, click the ellipses (...) on the dialog, and then click Delete. In the confirmation dialog, click Ok or Delete. Navigate to the SharePoint site containing the library for which you want to delete the file or folder. Click the name of the library on the Quick Launch bar, or click Site Actions, click View All Site Content, and then in the appropriate libraries section, click the name of the library or list. Select the item you want to delete by hovering over the selection column, and then clicking the check box. In the ribbon, under the Library Tools section, on the Documents or Items tab, in the Manage group, click Delete Document or Delete Item. If the SharePoint library is not already open, click its name on the Quick Launch bar. Point to the file or folder name, click the arrow that appears, and then click Delete Item. Was this article helpful? Was it missing content? If so, please let us know at the bottom of this page. Let us know what was confusing or missing. Please include your version of SharePoint, OS, and browser. We'll use your feedback to double-check the facts, add info, and update this article.